Valentine Greetings - To My Valentine - I'm looking for a Valentine Please say that you will be mine. 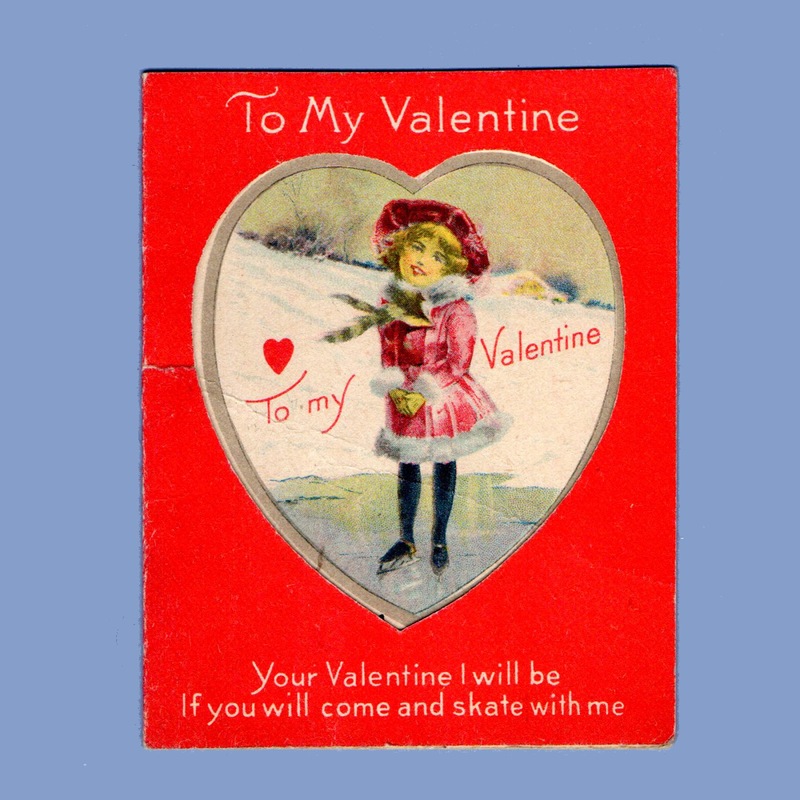 To My Valentine - Your Valentine I will be If you will come and skate with me. Valentine You're as cold to me As a winter's day But if you'll only let me - I'll dig the snow away. Hike off with me and be my Valentine. My spirits are down to zero But I could melt in a minute for you Valentine. Its SNOW USE It'll be a cold cold world If you won't Be My Valentine. 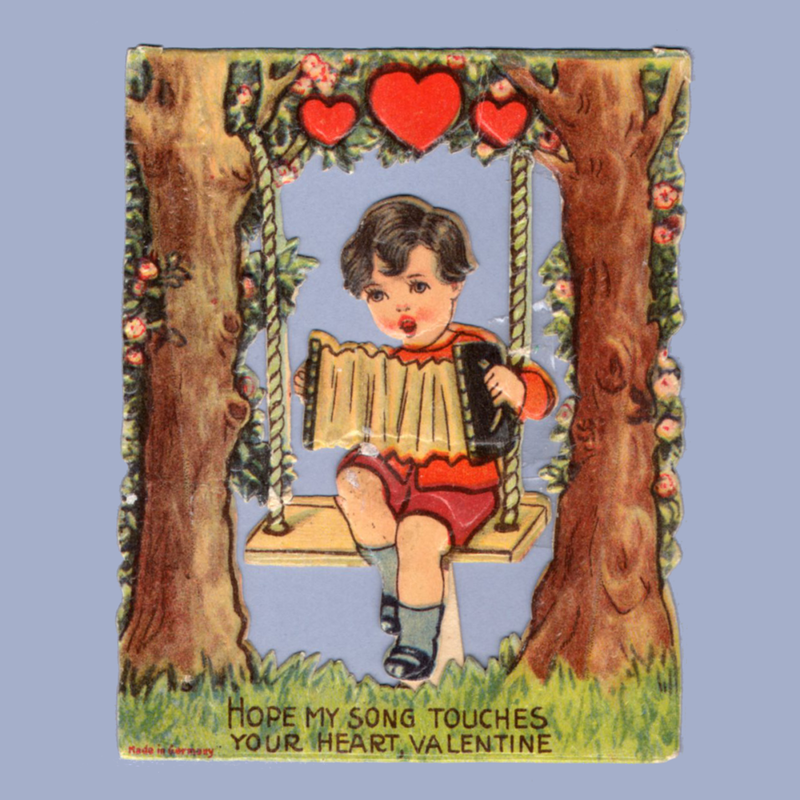 >Valentine Greetings ~ If valentine wishes were measured or weighed, Then this card of mine wouldn't do; I'd have to send them by Parcel post, Or they'd never get to you. Don't be so cold my Valentine. I wouldn't mind a spill on the Steepest hill If you'll just say you will my Valentine. SNOW use - I Love You Valentine! How happy we will be My Valentine. 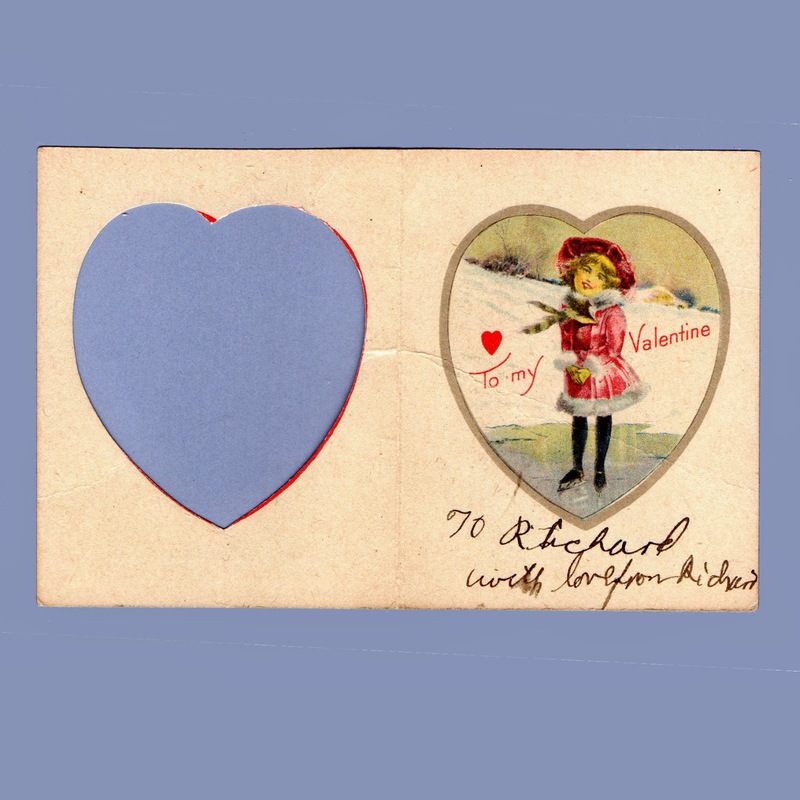 This card, Cupid's Minuet, is mentioned as "one of the best of the offerings" in an article on the new season of valentines that focuses on Nister/Dutton in Bookseller, Newsdealer and Stationer, Vol 20 pp 55-59 from January 15, 1904. I am rather shy, dear, or I might say something quite nice to you today You may have my heart and all that's in it if you'll give me yours this very minute. 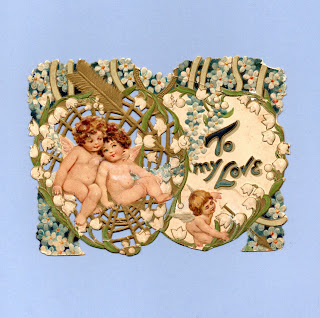 Frances Brundage (1854-1937) was, along with Charles Twelvetrees, an especially prolific valentine maker. The daughter of an artist, Rembrandt Lockwood, she learned to draw at an early age. She is said to have begun working at 17 years of age, after her father left the family. This would have been around 1871. Her first sale of artwork is stated by many sources to have been an illustration for one of Louisa May Alcott's poems. I've not found any details of this sale, including any indication of a date or which poem the illustration was for. This leaves me unsure of whether to regard this as an apocryphal story. I've also not found any illustration or art credited to her earlier than 1891, when she would have been around 37. That is the earliest dated entry for Brundage in the Library of Congress listings (for a book called Baby's Biography by A. O. Kaplan, published by Brentano's of New York; printed in Great Britain.) That's not to say there are not earlier works out there - perhaps it is rather that I have not yet figured out where to look. May Love's sweet music make bright each day, And Love's fair blossoms bestrew thy way. 7 3/8" x 6 3/4"
You've heard the old woman who lived in a shoe, Had so many children she didn't know what to do Till good old St. Valentine asked for a few So they could be bringing my greetings to you! On page 28g of New England Stationer and Printer Vol 11 from 1897, Brundage is mentioned multiple times in an ad for the Taber-Prang Art Company of 286 Roxbury St., in Boston (this was the company formed that very year when Louis Prang's company merged with another). Here she is credited with the creation of 2 calendars - The Flowers We Love and Sea Shore. She may have done other work for Prang at this early date or even before the merger. While she is widely regarded to have began working for Raphael Tuck around 1900, her name appears in an ad for Tuck as early as 1892. Appearing on page 20 of the advertising section in The Year's Art by Marcus Bourne Huish, et al., in it she is credited with creating for Tuck "No. 512 Two Pairs of Studies of Fast Asleep and Wide Awake, painted by Frances Brundage 4s. pair." This would indicate that the relationship with Tuck began as early as the decade before 1900. 6 1/8" x 3 7/8"
It is her creations for Tuck that many collectors are especially interested in. Favorite subjects include children and ethnic or cultural figures. While she was well known for her depictions of African-Americans and the Dutch in her day, to today's viewers these portrayals will largely seem stereotypical and caricatured, though perhaps not as harshly so as the portrayals by some of her contemporaries like Bonte. Her creations were in keeping with the attitudes of her day - a time in the USA when racial animus was acceptable - the assumed norm really - as undeniably insulting racial caricatures regularly appeared throughout popular culture - in advertising, in the popular minstrel shows, dolls, books, etc. Jim Crow was in full swing and race riots in Omaha (1891, 1919), Chicago (1919), Atlanta (1906), Tulsa (1921) and many more made the headlines again and again. Lynchings were not uncommon and scenes from those lynchings were treated as acceptable fare for adorning postcards. To my Loved One ~ Oh you it is, this heart of mine So fondly greets, my Valentine. Brundage made several cards for Raphael Tuck that have the same style 3-d effect as the package that opens on this card. However, at least one of these style cards is thought to be the work of Katharine Gassaway rather than Brundage (click to see our Katharine Gassaway page). 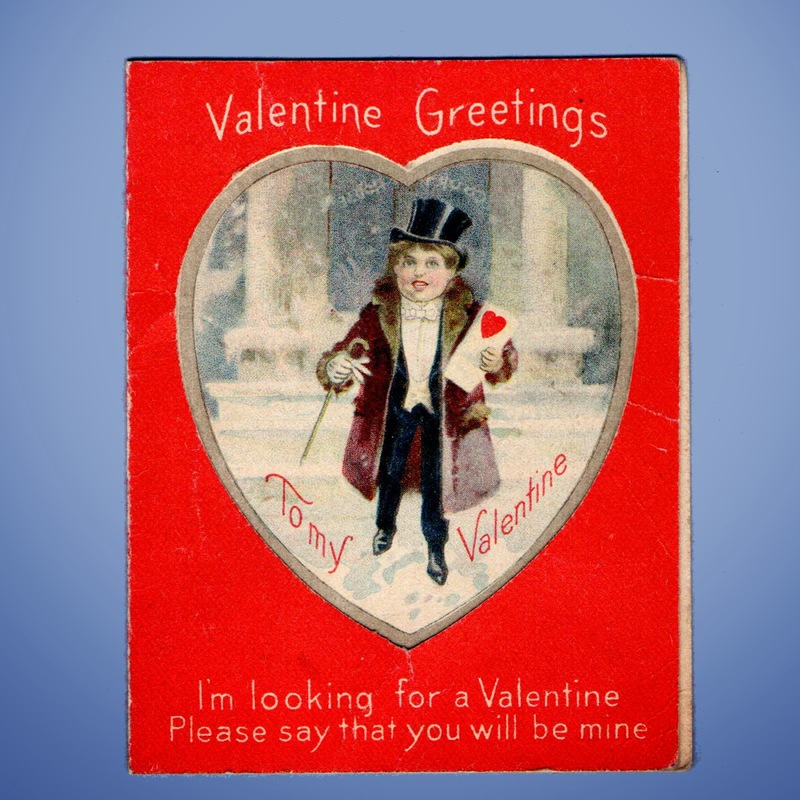 There is even an art deco styled valentine featuring a black figure with a noose around his neck and a little rhyme (Be Mah Valentine - I'll be hanged if yo' is goin' to say 'no.'). The card is all the more disturbing once you consider it was published at a time when lynching was a real phenomenon to be feared and it had a connection to the disapproval of the time of inter-racial romances. Ida B. Wells wrote in her 1890s anti-lynching pamphlet, Southern Horrors: Lynch Law in all its Phases, of cases where black men where lynched as a response to their consensual inter-racial affairs. Just what is the message intended by such a card? It is gallows humor of the most extreme; quite a creepy card that to some recipients could even be interpreted as a threat. Valentine Greetings ~ My heart is always fond and true It's every pulse will beat for you. Put in its setting like this, Brundage does stand out as someone who at least was not resorting to the minstrelsy-derived, blackface-type depictions of African Americans common in her time. However, it must be noted, she does indulge in some embarrassingly exaggerated dialect in the text of some, but thankfully not all, of the cards showing black and Dutch characters. To My sweetheart With you I am willing the world to go over My heart and my hand are yours evermore. 6 7/8" x 3 7/8"
To put these images even more firmly in the context of their day, this was a time in which the children of the poor no matter their complexion, labored in fields and factories. Most educations ended around 8th grade. Infant and maternal mortality rates were very high. According to the CDC, in 1900 as many as 30% of children in some cities would not reach 1 year old. Poverty was also widespread, with historians putting it at various ranges as official statistics were not kept at the time. But even the lowest estimates still put the poverty rate in 1900 as high as 20% and arguments have been made that the rate was really as high as 70%. Wherever the rate accurately fell, life was undeniably more brutal and difficult for most. Perhaps the sharp contrast to that harsh reality is why cherubic figures and romanticized depictions of children proved so popular. 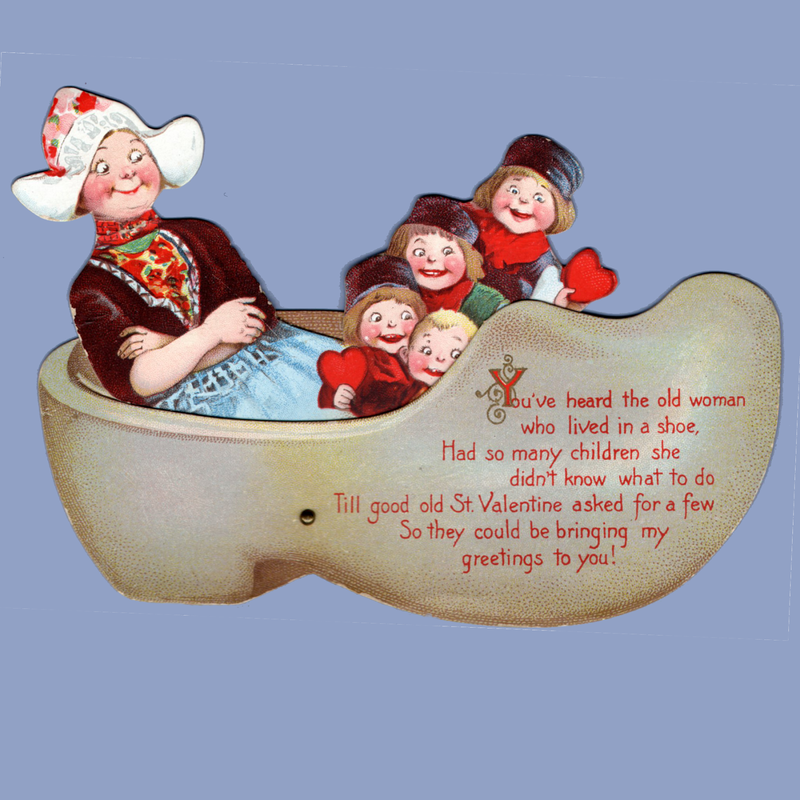 Yet these adorable children and angels shared the store shelves with horribly insulting cards such as some of those seen on our Black and Native Americana pages. 5 3/8" x 5 1/2"
Brundage went on to work for a number of other companies (see the bottom of this entry for a list of some of those). It was around 1910 she began working for Samuel Gabriel Co. 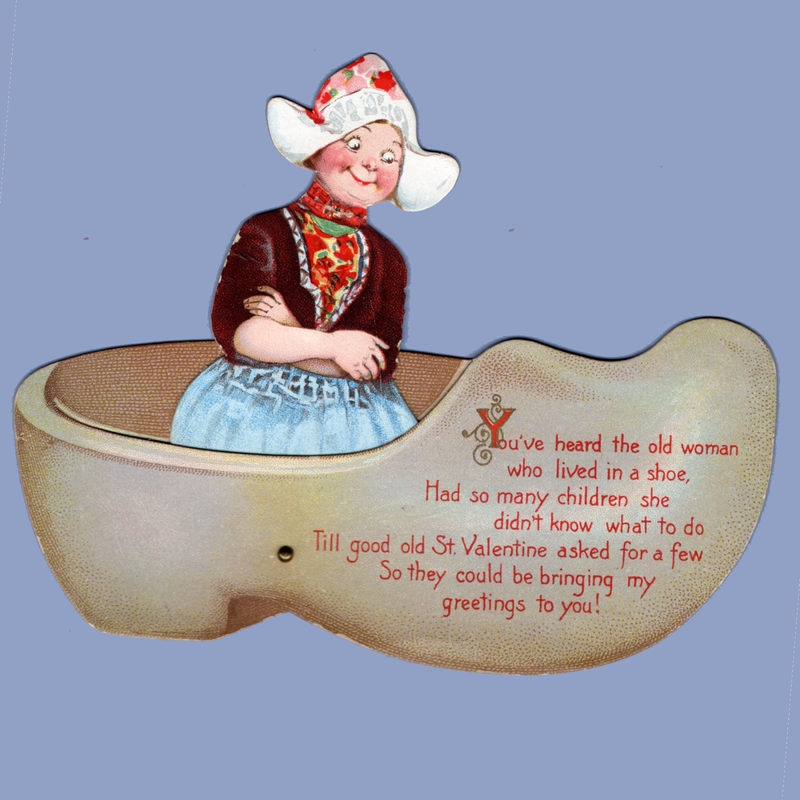 In addition to valentines and postcards, she illustrated many books and designed various other items including calendars, trade cards, paper and cloth dolls, advertisements and much more. 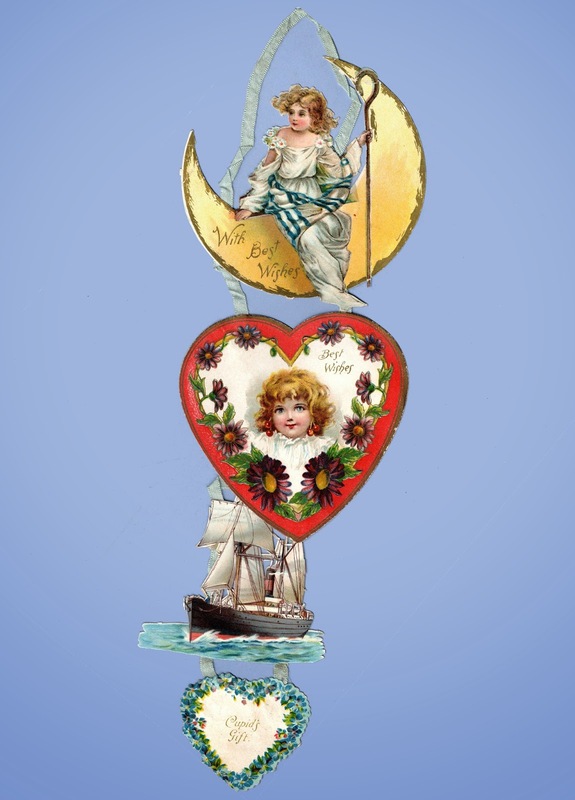 While many of her postcards are signed, the majority of her work on other styles of valentines is not. Say! I want you for My Valentine. To identify her work, pay close attention to the faces of the figures. Her eyes tend to be large and expressive. Facial features can look wry and a bit mischievous, seeming to give knowing looks to viewers. Its this way her characters engage the viewer, like they are sharing a secret, that compels so many to collect her art. Some of her more demure figures, however, can be hard to distinguish from the work of Ellen Clapsaddle or that of British artist Harriet M. Bennett. Here is where paying attention to the signed postcard images of these artists can be helpful. Specific characters or details used on signed postcards can often be found repeated on unsigned die-cut or folder-style cards, helping to distinguish who proper credit belongs to. To My Valentine - Dear Valentine My heart is big yet holds but one. You ask "who can it be?" I won't confess; - just try to guess. Just take a peep and see. 4 1/8" x 6 5/8"
To My Valentine - I engrave my heart On this block of stone, And send it to you In exchange for your own. My Valentine I'll STAKE my heart on you. Why don't you give me a ring? Most of her pieces will date from the mid-1900s to the mid-1920s though some may be a little earlier or a little later. 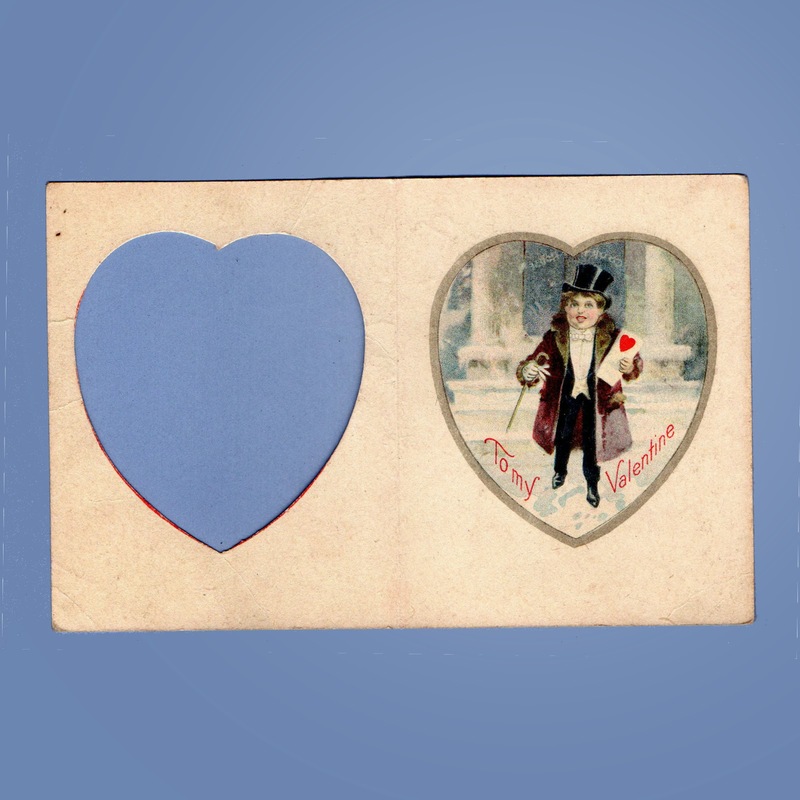 The cards are chromolithographs and are usually quite detailed and often enhanced with embossing. Brundage continued working steadily late into her life producing a large volume of items for collectors and admirers to swoon over. Be sure to check back every now and then as we have a number of valentine cards by this fabulous artist yet to be photographed and shared with you. As often as I think of you My heart is all a flutter I'm looking for a little cook to get me bread and butter. 6 3/8" x 6 7/8"
To My Valentine ~ Let's meet to-night-just you and I In a quiet spot where none can see, And I'll tell you the secret why - Your Valentine I want to be. To My Valentine - Whether you love me or not, The daisy is sure to tell; But this is the honest truth; I love you very well. 4 1/8" x 6 3/8"
To My Valentine - There's nothing half so sweet in life As on a pie to dine; Unless it be to kiss you dear, My little Valentine. To My Sweetheart - If you'll let me be your lover, I'll feel like a pig in clover. 9 1/8" x 6 1/2"
I suspect this may be the work of Brundage. 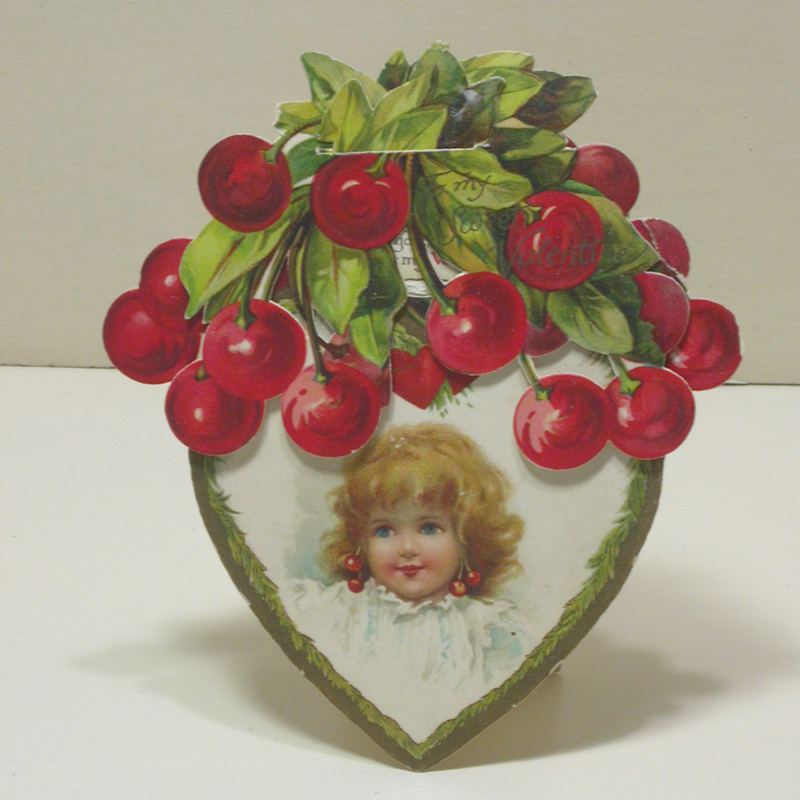 The same child with cherry earrings appears on the hanging card below. With Best Wishes - Best Wishes - Cupid's Gift. 13 1/2" x 4 1/4"
For more cards by Brundage see our Fans page. Accordion to me - You are my Love! 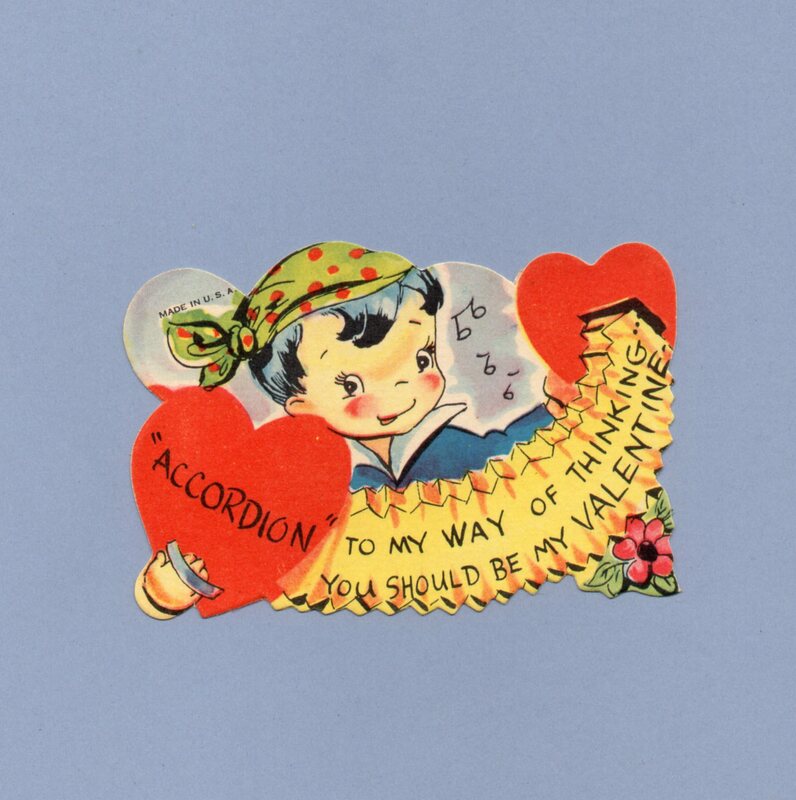 Accordion to My Way of Thinking You Should be My Valentine. 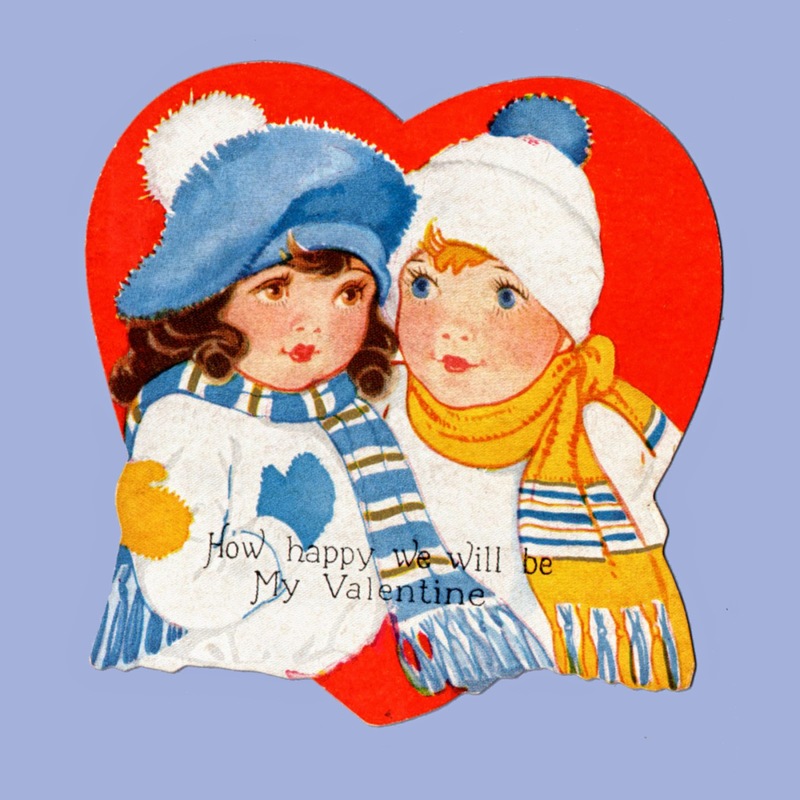 The Same Old Wheeze ~ Be My Valentine. To My Dear One - I make-a da song I sing-a my bes'! Mebbe you be My Valentine - yes? My heart is in TUNE with yours My Valentine. 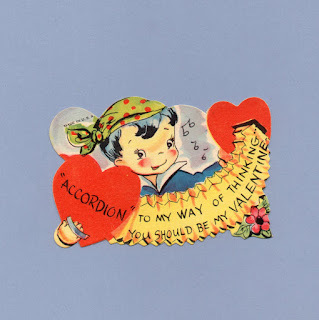 ACCORDION to my way of thinking - you should be my Valentine! 5 1/8" x 6 1/2"
I'll sing your praises night and day - Because I think you are Okay!